An unsold Cadillac ATS vehicle sits in the front lot of a Cadillac dealership in Plymouth, Mich., last week. DETROIT (Reuters) -- General Motors' strategy of rebuilding the Cadillac brand has run into twin roadblocks: the carmaker can't persuade enough American sedan buyers to switch from foreign competitors such as BMW or Mercedes, and it can't make enough of its Escalade SUVs to satisfy domestic demand. Even though chrome-bedecked Escalades retailing for more than $100,000 each are rolling every day out of an Arlington, Texas, factory that's been working weekend overtime for months, Cadillac still can't keep more than a few weeks' worth of the big SUVs in stock. By contrast, its dealers are offering discounts of thousands of dollars on the ATS sedan, intended to compete with the BMW 3 series, and on the CTS sedan, meant to rival the Mercedes E-class. At Brotherton Cadillac Buick GMC in the Seattle suburb of Renton, Wash., owner Brad Brotherton is offering 2014 ATS sedans at up to $12,000 off a sticker price that starts at about $33,215. 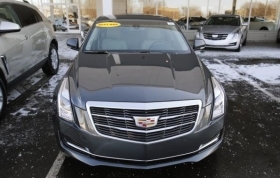 In St. Peters, Mo., near St. Louis, Bommarito Cadillac was cutting as much as $17,500 off the price of a 2014 CTS sedan, which starts at about $45,345. "Cadillac made a commitment to relieve dealer inventories by incentivizing" the leftover 2014 sedans, Brad Brotherton told Reuters. "Dealers had been asking for that for a long time." The fire sale marks a setback for Cadillac's strategy to challenge BMW and Daimler AG's Mercedes-Benz brand head-on in the luxury sedan market. But while an American Cadillac owner will happily consider a BMW or a Mercedes, drivers of those famous German cars just won't put a Cadillac on their shopping list. "The problem is, Cadillac is not BMW,” said Larry Dominique, president of ALG in Santa Monica, Calif., which sets and tracks auto leasing values. "The ATS is the product that Cadillac could have used to build brand equity, but it was overpriced and overproduced." Cadillac has wrestled for more than a year to shrink inventories of unsold ATS and CTS models. In mid-December it shuttered the Lansing, Mich., plant that builds the ATS and CTS for six weeks. The factory reopened January 26 on a single shift with a greatly reduced production schedule. Even with the production cuts, Cadillac and its dealers had about four months' worth of unsold CTS sedans and six months’ worth of unsold ATS sedans on hand at the end of January, a Reuters analysis showed. In January, GM sales rose 18 percent, largely on the strength of full-size trucks and SUVs. Cadillac sales increased just 2 percent, with ATS sales dropping 8 percent from a year ago and CTS sales down 24 percent. "We understand we have a lot of work ahead of us with Cadillac," GM CEO Mary Barra said last week. Dominique said Cadillac's residual values -- the projected end-of-lease values, expressed as a percentage of the new car's retail price -- are among the lowest in the luxury segment, ranking near the bottom with Lincoln and Jaguar. So far, Cadillac has resisted price cuts on either model, although it recently tweaked option prices. Keeping base sticker prices unchanged could undercut the resale values used to set lease prices, Dominique said. The failure of the ATS and CTS to hit their targets is costing GM. To kindle demand, Cadillac has offered subsidized leases, discounted financing and rebates. Consumers are being given $1,000 on the 2015 ATS and 2015 CTS, $4,000 on the 2014 ATS and $6,000 on the 2014 CTS. But some dealers are getting additional subsidies from Cadillac -- up to $5,000 more on the 2014 ATS and up to $7,000 more on the 2014 CTS -- to help clear out unsold cars. Cadillac has cleared 90 percent of the leftover 2014 sedans, a spokesman said on Monday. Meanwhile, the Escalade is hauling in the cash, as year-on-year sales in January rose 149 percent, according to Cadillac spokesman David Caldwell. GM's truck factory outside Dallas, which builds the Escalade and long-wheelbase Escalade ESV and their Chevrolet and GMC siblings, has been running steadily on three shifts and working weekend overtime for months to try to keep up with unrelenting demand. "If we could run that plant eight or nine days a week, we probably would," said a GM insider familiar with the production schedule. Cadillac marketing boss Uwe Ellinghaus, a former BMW executive, calls the Escalade "almost a brand in itself," but adds that the big SUV "does not set the direction" for Cadillac's long-range strategy. As it is, Cadillac is likely to get only "a few more" Escalades this year, according to Caldwell, who said, "A little bit of scarcity isn't a bad thing."